It’s taken a while, but Britain finally has a carbon bike brand to be proud of. We’re super happy to now be stocking Aprire Bicycles, a company based out of Cheam in Surrey. They make carbon frames backed by years of experience in the bike business and a thorough understanding of the super lightweight, racer’s material of choice. The benefits of a carbon fibre frame are not a secret. They’re light and strong and responsive, which is what makes them the choice of the pro teams. What is a bit more shrouded in mystery is how carbon is made. Fortunately we know a man who knows all about it. So they’re pretty confident in their work. One of the things that makes carbon so tricky to build with with is the lay up process. Carbon gets its strength from the combination of multiple layers, which have to be wrapped together into the desired frame shape. The fibres in carbon fibre are stronger in one direction than they are in another, so the angles at which you layer each piece are really important. This, in a nutshell, is the layup. Lucky for us – and for you if you’re considering a carbon fibre frame – Phil is an expert in carbon lay ups. He has been working with carbon for several years and is a guy who really knows his stuff. Another thing that makes Aprire bikes that little bit more unique is their decision to use factories that have a specialism in working with carbon fibre, as opposed to those that specialise in building bike frames. That means the people making your frame (working from the lay ups created by Phil and his team) are experts in using this type of material – and that’s what you want when you’re working with a material that’s notoriously easy to get wrong. Don’t hesitate, if you’re after a carbon bike to do some fast-paced miles on in the coming summer then lets get you set up with an Aprire. If you’ve never been to Bespoked before, let us enlighten you about exactly what it entails. The “UK handmade bicycle show” (to give it its full tagline) is an event designed to celebrate Britain’s frame builders and makers of custom or handbuilt bikes. It’s a great opportunity for members of the public too – especially if you’re interested in having a custom build made – to check out a bunch of different builders and see which is likely to be the best fit for you. This video from the 2015 show gives you a great sense of why Bespoked is so special and features a couple of our friends, including the Bicycle Academy and our man Ted James. It also showcases the beautiful venue, Brunel’s Old Station in Bristol, which is one of the most unique places you’ll ever attend a cycling show! Bespoked 2015 from Bespoked on Vimeo. The success of getting a custom bike built rests just as much on the builder you choose as it does on the parts you pick. In fact, it’s probably more important because a good builder will be able to steer you (pardon the pun) to the right componentry choices. That’s why meeting face-to-face before embarking on a build project is such a valuable part of the process – you can talk about what you want to get out of a build and ultimately your finished bike will be much the better for it. We’d love to see you at the show for a chat about your dream bike – and how Cloud 9 can make it a reality! In the past we’ve unveiled new bikes at Bespoked, such as our Cloud 9 Street Racer and we always enjoy the opportunity to show off what we’ve been building – as well as checking out the competition! This year we’re keeping things tightly under wraps until closer to the show, but we can tell you we’ll really be pushing it in terms of producing an array of bikes in different cycling disciplines. 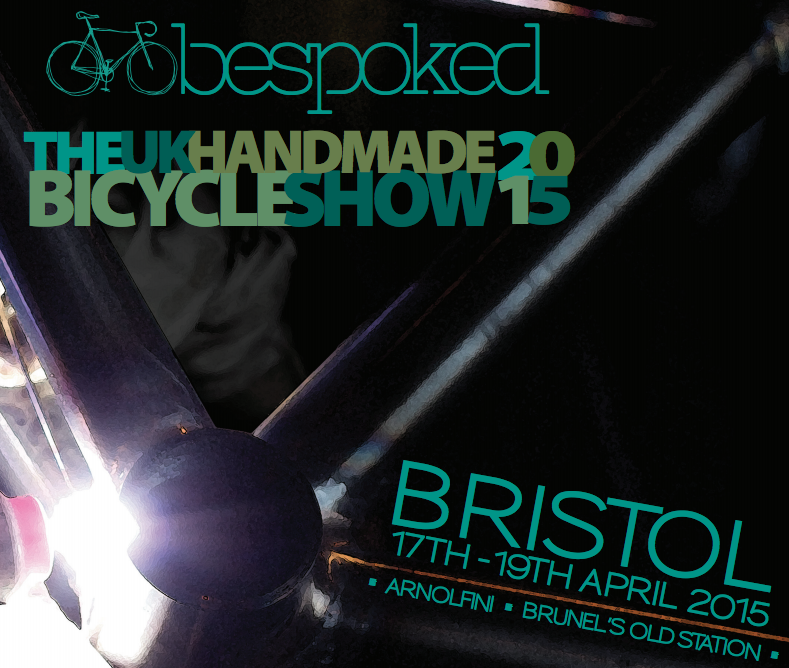 We’ll be at Bespoked for the full show weekend, which runs 15 – 17 April, so please do come and say hi! Get your tickets here. Britain’s leading hand-built bike show, Bespoked 2015, is just a few days away and we’re really excited to be taking part again. Long-time Cloud 9 fans will remember we launched our awesome Street Racer at last year’s event, so you know you can expect something awesome at Stand 37 in Bristol on 17 – 19 April. Cloud 9’s Kris has been hard at work on our builds for weeks now and while we don’t want to give too much away, what we can say is we are building the best city bike the world has ever seen! Here’s a few snaps of the build in process to whet your appetites! For those not familiar with Bespoked, it started as an opportunity for the best British frame builders to show off their wares, but it has quickly expanded into one of the leading shows for premium bike brands and frame builders from from all over the world. In fact, we’re as excited about seeing what the other exhibitors, like our pals at Feather Cycles and Ted James Design, will bring as we are about showing off our own work. If you’re interested in buying a handbuilt bike, love design and innovation, or you’re just passionate about cycling then you need to come join us at Bespoked. Get your tickets here. Sunday: By Appointment – please contact us.